The calendars have arrived and they look FANTASTIC!!!! Can't wait for all you pre-order folks to get them. I'll be getting them into the mail to you this weekend! I ordered a few extra so if you're still interested in purchasing one, you can do so here! Just a reminder that you can pre-order my 2015 "Lessons from the Studio" calendar for just $16 (plus shipping) through tomorrow, Sunday, November 2. After that, the price goes up to $19 (plus shipping)! Visit my shop or send an email to Cheers "at" BarbSkoog "dot" com. The month-by-month planning calendar is a compact size (5″ x 11.5″) and is great for kitchens, work spaces, and even for toting around in your purse (which I do all the time). It is spiral bound which makes it easy to lay flat on a desk or hang on a wall. Each month features one of my marbled pieces along with a tidbit of soulful insight or advice I gleaned from my studio experiences. For more information and images, check out my previous post. 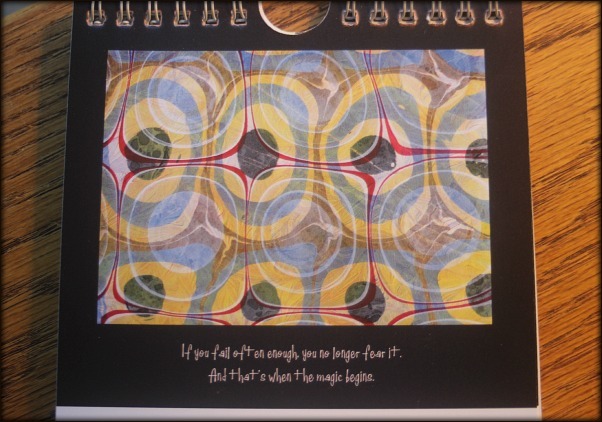 The 2015 "Lessons from the Studio" Calendars are Here! Well, almost here. I have a copy of my press-check calendar and it looks fantastic! I wasn't going to do a calendar this year (I got so busy with the eCourse filming project) but then as I started looking back through my work and my notes, I got inspired! 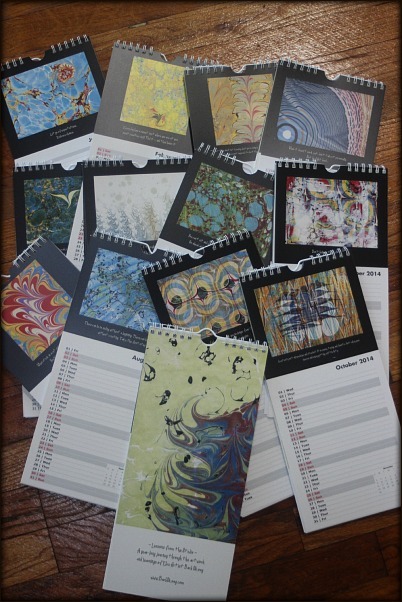 Wow, I have a lot of great pieces I have yet to share and the calendar is a fun way to do that. 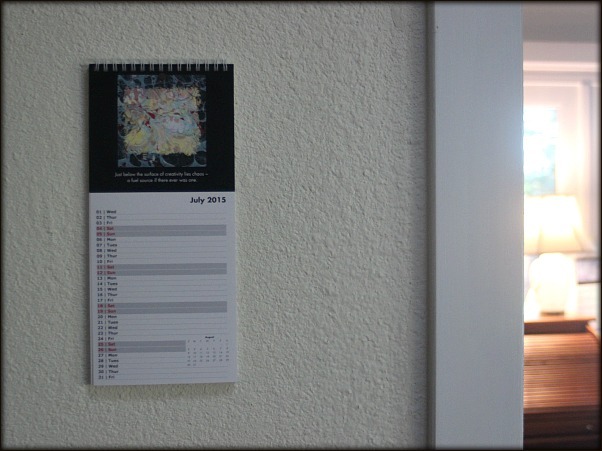 Last year, I had to re-print the calendars two times due to demand. So this year I'm taking a new approach: pre-orders! And at a special price! If you order by Sunday, November 2, you can get my calendar for $16 (+ shipping and tax, where applicable). That's the same price as last year! After November 2, the price goes up to $19 (+ shipping and tax, where applicable). This year's calendar is another great one. I know I say this every year...but I think this one is my best yet. I swoon over each image which is accompanied by words of wisdom and lessons learned from my extensive time in the studio. 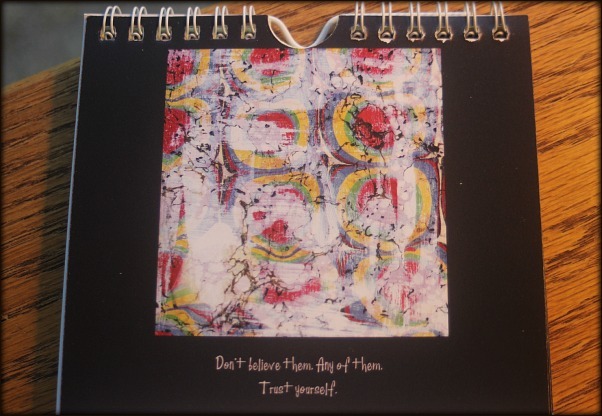 This calendar is a true reflection of my hands and my heart! To pre-order at the special price, head on over to my store (if you want to pay by credit card through PayPal) or send an email (if you want to pay by check or cash) to Cheers “at” BarbSkoog “dot” com. 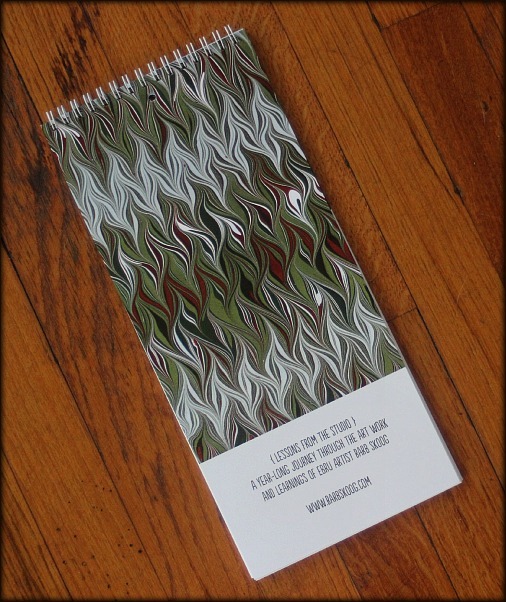 Calendars will be mailed out around Thanksgiving time (or sooner if the shipment arrives earlier than that!). Below are images included in this year’s calendar (the images will not have my website address plastered all over them). To see my “Lessons from the Studio,” you’ll just have to buy it! Calm down, Barb...it's just a calendar. But it's really hard to when IT LOOKS SO GREAT!! I am so proud of this one...12 really beautiful images created this past year accompanied by thoughtful and motivating quotes. For those who have already placed their order, I will be shipping them out to you this weekend. There are only NINE SIX THREE calendars left...if you want one, you better grab one before they are gone. To see the images included in this year's calendar, check out this post. Ready for a new year?! Yeah, me neither. Hard to believe 2014 is right around the corner. 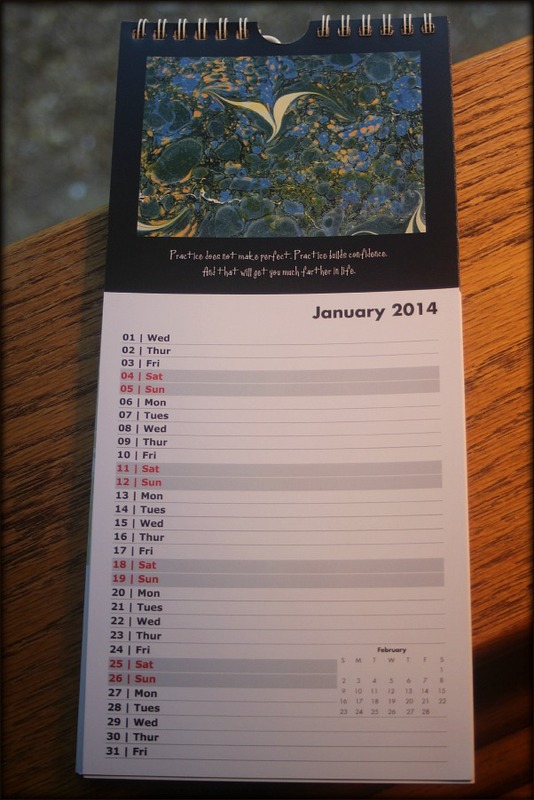 The point is especially driven home when I have to keep track of my appointments for 2014 on a slip of paper ~ that was until my new calendar arrived!! And I think this one might be my best yet. 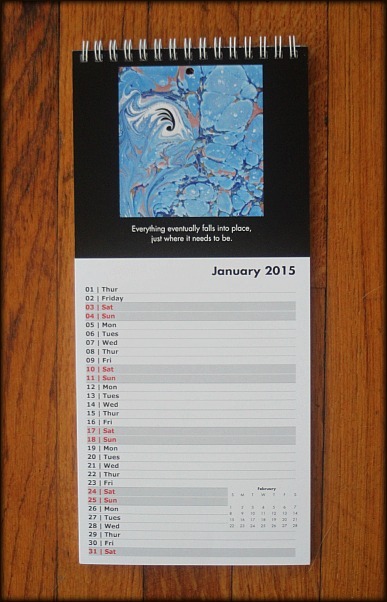 I have once again printed a 12-month calendar with my favorite marbled images created this past year. Each image is accompanied by words of wisdom and lessons learned from the studio. As many of you know, this year was an epic studio year for me. I spent a lot of time working on new series, completing ones that really felt right, experimenting with new materials, and deepening my own personal marbling style (ever evolving, of course). The results were AMAZING ~ so much fun time at the tank, stellar pieces that left even me surprised, successful shows, and a momentum that continues to build. 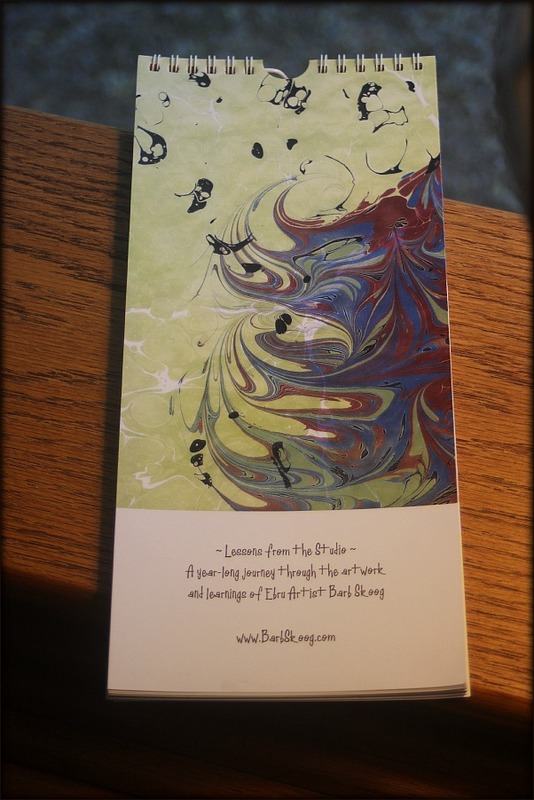 It was such a profound time for me that after a day in the studio, I would take to my journal and reflect upon what I learned that day ~ both technically as well as soulfully. And that's where this calendar comes from ~ my hands and my heart. I have printed a very limited supply of these gems so if you want one, head on over to my store (if you want to pay by credit card through PayPal) or send an email (if you want to pay by check or cash) to Cheers "at" BarbSkoog "dot" com. 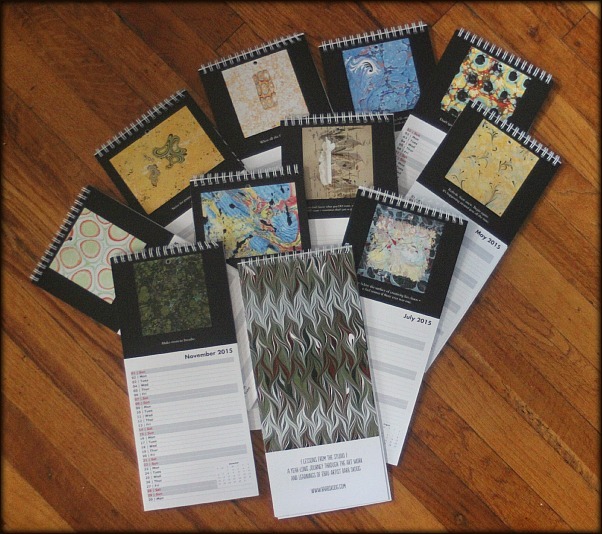 Calendars will be mailed out around Thanksgiving time (or sooner if the shipment arrives earlier than that!). It is an exceptional value at just $16 including shipping or personal delivery by me! Below are images included in this year's calendar (the images will not have my website address plastered all over them). To see my "Lessons from the Studio," you'll just have to buy it!